Heads up birders! 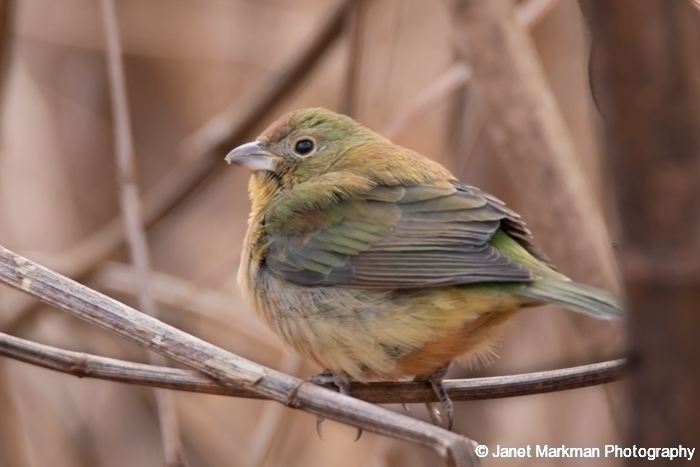 A Painted Bunting (Passerina Ciris) was actually spotted in the Hatfield Swamp (a freshwater wetland area right here in Western Essex County, New Jersey) on December 18, 2015. This Neotropical bird (one native to the regions of South America and North America – south of the tropic of Cancer) is one you would NOT normally find in – of all places – New Jersey. 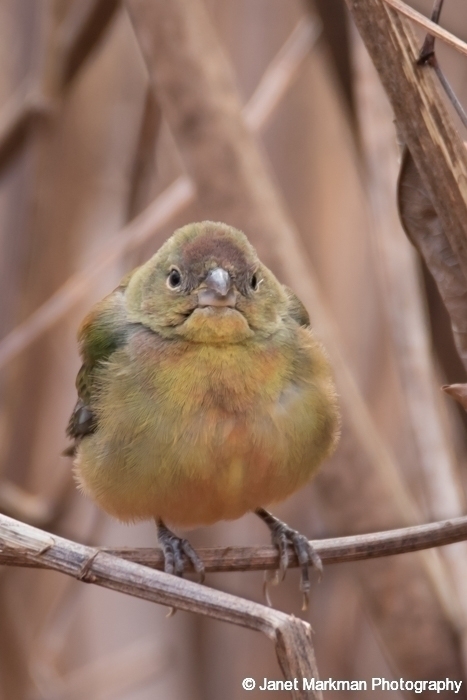 The Painted bunting is actually a type of Cardinal (Family Cardinalidae), a family of small insect /seed eating birds with thick conical beaks. 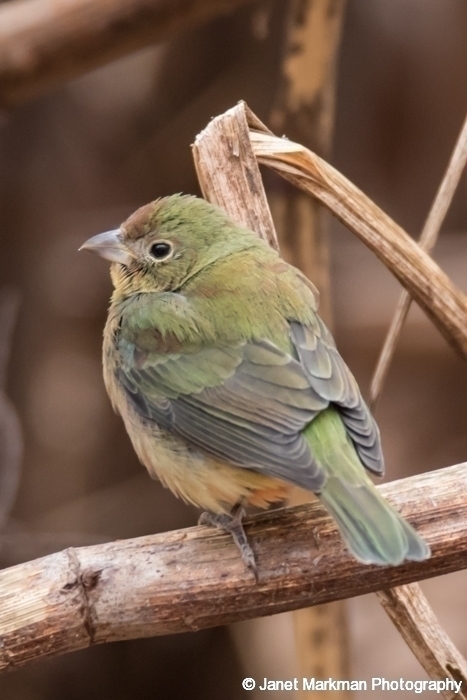 The Painted Bunting’s normal pattern for migration traverses the Southeastern United States to northeastern Mexico during its breeding / summer season, and in the winter, across Florida, the Bahamas, Cuba, and Mexico, south to Costa Rica and Western Panama. After reading about the spotting of this creature, I set out to do the same. I finally met with success on my third attempt (three times is a charm) on January 3, 2016, and have seen this Painted Bunting several times over the last couple of weeks. It is very exciting to see a bird who has strayed outside of its normal range. Male Painted Buntings are stunningly colored – sporting blue heads, red under-parts, and green backs. 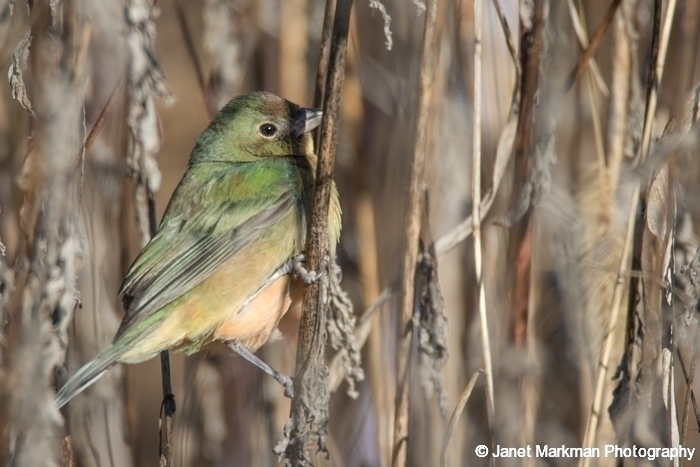 Juvenile male Painted Bunting’s plumages are primarily green, and will not display their bright multi-colors plumage until their second year. These birds tend stay low to the ground in dense cover. In the Hatfield Swamp I have also observed the Painting Bunting perched on the shrubs, including the phragmites (phragmites australis) as well as on other shrubs/grasses surrounding the phragmites. Phragmites are also known as Common Reed, a large perennial grass that is prevalent in wetland areas. I hope this Painted Bunting decides to adopt the Hatfield Swamp as his new home for a while, as he will eventually molt into his more colorful and radiant adult plumage. I will definitely be looking out for this bird and will post further updates (with photos) if he does decide to stick around. What an interesting find! Good for you spotting him on the third try! Maybe now that he found his way here once he will do it again- when he has the colorful plumage. Very exciting!